OK I have to document this before I forget. First of all, aren't these pictures cute? 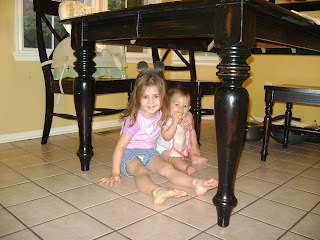 The girls were playing together under the table in the kitchen and I had to snap a shot. But the real subject of this post are the ears. Avery's ears...I mean Mickey's ears. It is safe for me to say that Avery LOVES Mickey Mouse. For some reason about a year ago, she found this Mickey Mouse doll that she had had for a while and never cared about. She got kind of attached to him when we moved from our old house to our new last September. Then she watched a little bit of Mickey Mouse Clubhouse at Nona's house which was a treat because we don't have cable. And somehow she got hooked. She talks about Mickey Mouse a lot. In fact, she assigned us all characters. I will give you the list. The funny thing is she NEVER forgets who any of us are! If we forget she will quickly correct us. I have no idea why we all are who we are, but in her head, it makes sense and she calls us by these names OFTEN! If I call her "goofy" sometimes meaning "silly" she says, "No, I'm Mickey." It's hilarious. 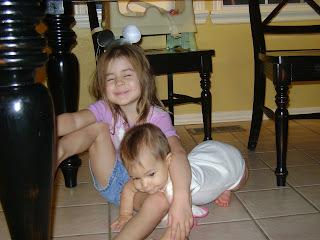 Actually after several months of this, I'm kind of sick of it, but I play along like a good mother should! :) When she's older, she'll probably roll her eyes when I tell her this story, but I have to document it so I won't forget to tell her! I love you, Mickey! !